In London, and across the country, people have remembered the terrorist attacks of July 7, 2005, when 53 died after three bombs were detonated on Underground trains, and one on the top deck of a bus. This has been not only a time for reflection and remembrance, but also a realisation that there are always forces that seek to divide people. That is something that the cheaper end of the Fourth Estate found difficult to grasp. What happened on that morning can be told very simply. Four young men arrived in London with their bombs hidden in rucksacks. The intention was for all to board Underground trains. Two boarded Sub-Surface line trains; their devices exploded near Edgware Road and Aldgate stations. One boarded a Piccadilly Line tube; his bomb went off close to Russell Square station. The fourth man panicked. He boarded a Number 30 bus instead, and his bomb exploded as he sat at the rear of the top deck. The bus was passing through Tavistock Square. While all the bombs caused appalling loss of life, the Piccadilly Line device led to the worst carnage: in a tube tunnel, the blast had nowhere else to go but along the train. It goes without saying that all the trains were heavily loaded with morning commuters. The emergency services, voluntary groups, anyone else with medical training, passers-by: all gave of their best to help the injured, assist the traumatised, and comfort the bereaved. The press found many heroes, and rightly promoted their stories. What one newspaper group then did was to misuse their stories for their own ends, and it will surprise no-one that the press empire in question was that of Rupert Murdoch. Take the story of firefighter Paul Dadge, who will be remembered helping a seriously burned woman. He became a “tabloid hero”, but what the press wasn’t telling its readers is that the now-defunct Screws was hacking his phone. As campaigning group Hacked Off have observed, “He has subsequently criticised the media coverage of the phone–hacking trial as for ignoring victims and rebuked the newspaper industry for continued press abuse and intrusion into people’s lives”. His ebook The Man And The Mask is available HERE. Then there was John Tulloch, who was injured in the Edgware Road blast. The photo of him, bloodied and bandaged, was used by the Sun to promote the headline “TELL TONY HE’S RIGHT”, as the paper threw its weight behind Blair’s push for 90 day detention without trial. Tulloch did not support this idea. His comment today bears repetition. “As a direct result of 7/7 I was door-stepped by News of the World who then misquoted me to the extent of causing embarrassment to my employer who had been very supportive to me, and my image was used on the front page of The Sun with the words 'Tell Tony he's right' next to my mouth, suggesting that I supported Blair's 90 days without charge bill which I was completely against - and then I was phone hacked as well. This composite of press abuses I experienced should remind us that Lord Leveson's inquiry was not just about illegal acts (phone hacking) but about changing press ethics and culture as well”. In and among the suffering and bravery, even then, the Murdoch press were behaving like utter filth. 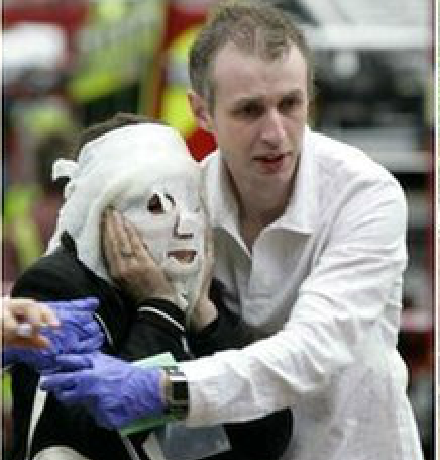 As we remember the victims of 7/7, let us not forget that.